I can’t recall the full serial number, but the frame set I picked up from Andreas has a serial number that begins with HB. Update: I just checked the frame, the serial number is MH001, but was originally BH001. Judging by the deeper impression, it's obvious the 'M' was stamped over the 'B' vs the other way around. Finding forks may be a bit difficult, but these are the ones you'll be looking for. 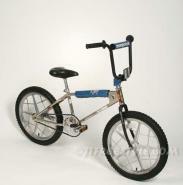 The shape of the drop outs are almost identical to the Rebel Racing mini forks seen on the (black) Blazer complete in the rear. Damn! Now that's one hell of a come up.